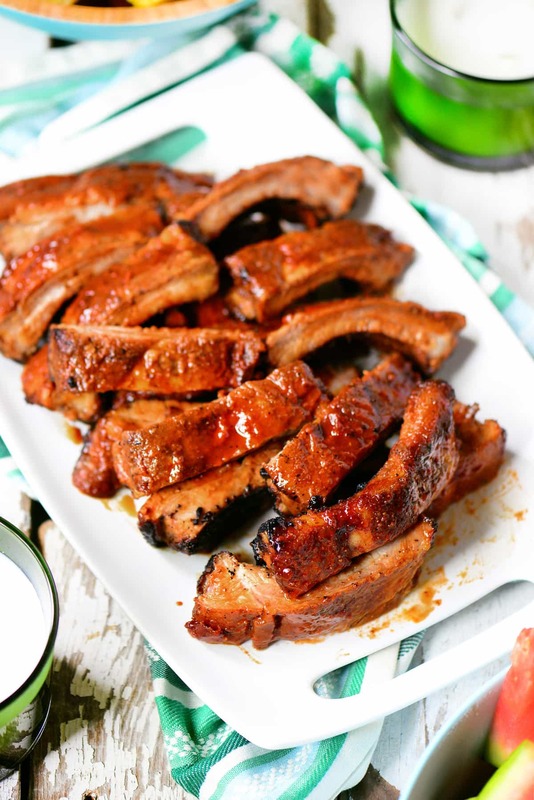 These tender Grilled Barbecue Ribs, made on a gas grill, are sweet and spicy with the smoky flavor everyone loves. They are perfect for summer entertaining. Summer entertaining is all about including the outdoors from cooking on the grill and eating outside to the fresh fruits and vegetables on the menu. Backyard cookouts are a great opportunity to have friends over and enjoy the beautiful weather. I love picking up my supplies and ingredients from Sam’s Club. 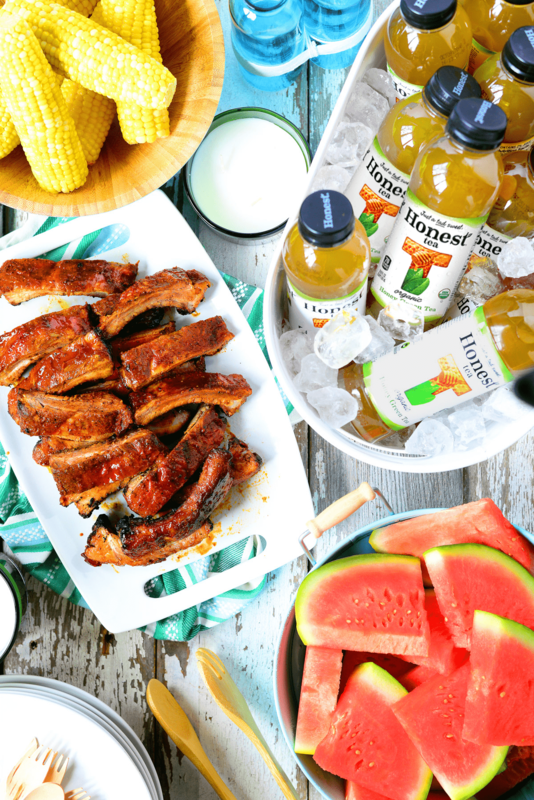 I can find everything I need to make it easy: Member’s Mark Pork Loin Rack Ribs for grilling, a pack of Honest® Tea Honey Green to drink and Sam’s Club Potato Salad made fresh daily. I decided to try making barbecue ribs on the grill for the first time. These are Member’s Mark Pork Loin Rack Ribs from Sam’s Club. 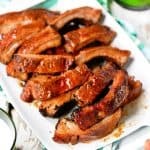 I did some research online, read blog posts and watched videos to get some tips and tricks for making ribs on the grill. The biggest takeaways were to cook them low and slow with indirect heat, add smoke for flavor, use a spice rub, and add the barbecue sauce near the end. 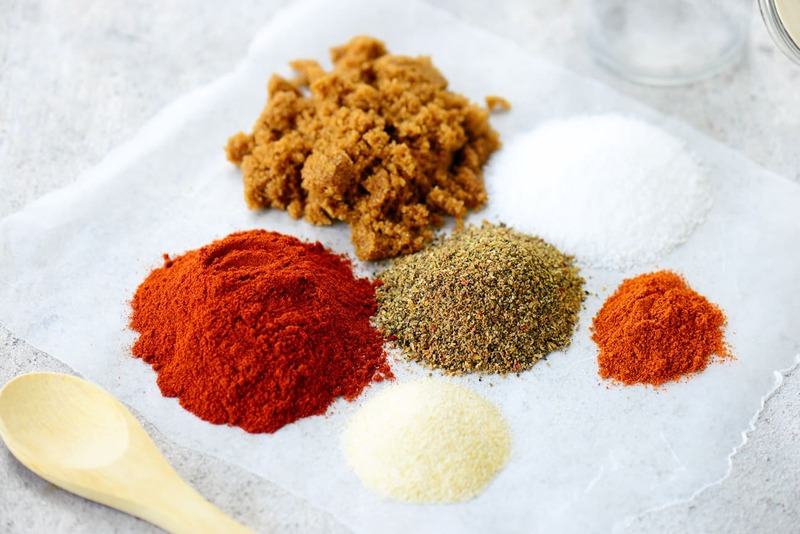 Mix together brown sugar, paprika, black pepper, kosher salt, garlic powder, onion powder, and cayenne pepper. Put the rub in a small jar and only remove what you need, saving the rest for another time. Start by peeling the thin, shiny membrane off of the bone side of the ribs. Use a knife to lift up the end of the membrane, grab it firmly with a paper towel and peel it off in one piece. Sprinkle the savory rub on both sides of the ribs, gently rubbing the seasoning in with your fingertips. Cover and place in the fridge for 30 minutes. This step is optional but it will add a smoked flavor to the ribs. 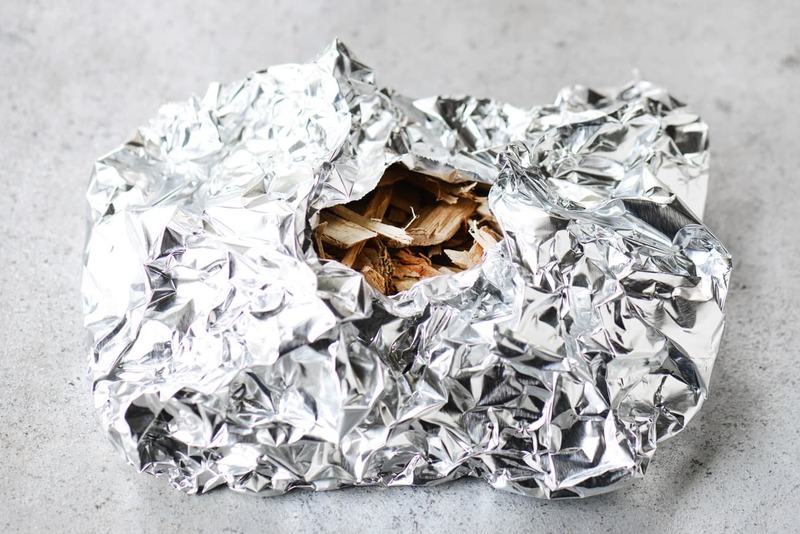 Place two to three handfuls of smoking chips in a center of a piece of heavy-duty foil. Fold up the sides to wrap around the wood chips leaving the top open. Put the smoke bomb foil packet on the grill and heat up the grill to 275-300 degrees. Depending on your smoking chips, you may have to use more than one smoke bomb foil packet during the grilling process. If one stops smoking, replace it with a fresh smoke bomb foil packet. Remove the ribs from the fridge. Turn the burner on the left to low and turn the other burners off. Place the smoke bomb foil packet over the burner that’s on. Lightly grease the grill rack with olive oil and put the ribs on the right side away from direct heat. Close the cover and cook the ribs for 90 minutes keeping the temperature at 275-300 degrees. It was windy when I was making these ribs and the temperature kept dropping. So, I turned the heat on the far left burner to medium and the second one from the left to low. I lined up the three racks of ribs all the way on the right. Do what works best for your grill to keep the temperature close to 275-300 degrees and the ribs away from direct heat. Mix together pineapple juice, honey, sriracha sauce, olive oil, and soy sauce. After 90 minutes of grilling, remove the ribs from the grill. Place a rack of ribs in the center of a large piece of heavy-duty foil, lift the sides of the foil a bit to make a shallow bowl. Pour 1/4 cup of the grilling sauce over the ribs and fold the foil to form a packet sealing the ribs and sauce inside. Repeat with the remaining two racks. 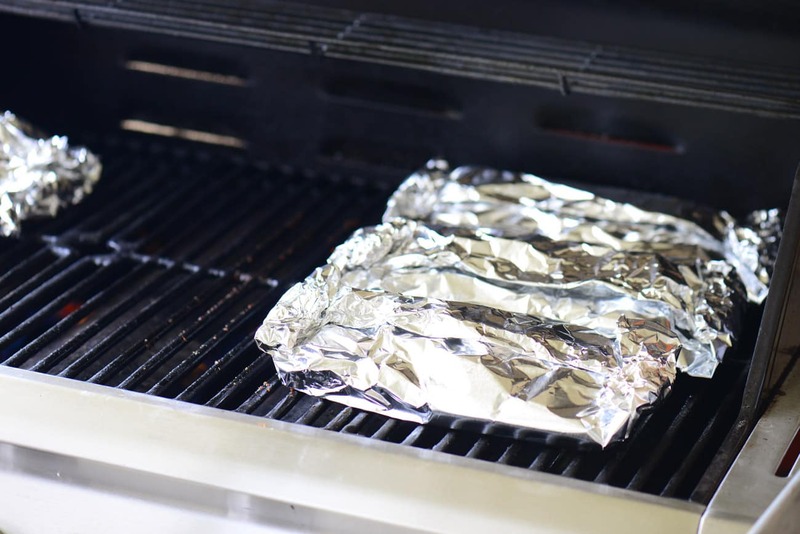 Put the foil covered ribs back on the grill and continue to cook them over indirect heat, at 275-295 degrees, like before for another 90 minutes. Remove the ribs from the foil, brush with your favorite barbecue sauce and place directly on the grill rack on the right side. Turn the heat on the left burner up to medium and cook the ribs with the indirect heat until the barbecue sauce starts to caramelize about 20-25 minutes. Remove the grilled barbecue ribs and allow them to rest for ten minutes before cutting them into pieces and placing them on a serving tray. Put chilled, crowd-pleasing Honest® Tea in a large bucket with ice. Scoop the Sam’s Club Potato Salad into a bowl. Place the platter of grilled barbecue ribs on the table. Finish the meal off with some fresh summer fruit and vegetables such as sweet corn, watermelon, and a veggie tray. Enjoy the summer while making memories with your family and friends! Want More Grilled Recipes? We’ve Got You Covered! Spicy Pineapple Chicken Kabobs: This is an easy grilling recipe for Spicy Pineapple Chicken Kabobs. The chicken is marinated in a sweet pineapple marinade and the kabobs are brushed with a spicy pineapple sauce during grilling. Garlic and Herb Chicken Marinade: This Garlic and Herb Chicken Marinade recipe makes the BEST juicy, tender, flavorful chicken that is a perfect main dish or delicious on a salad and pasta. 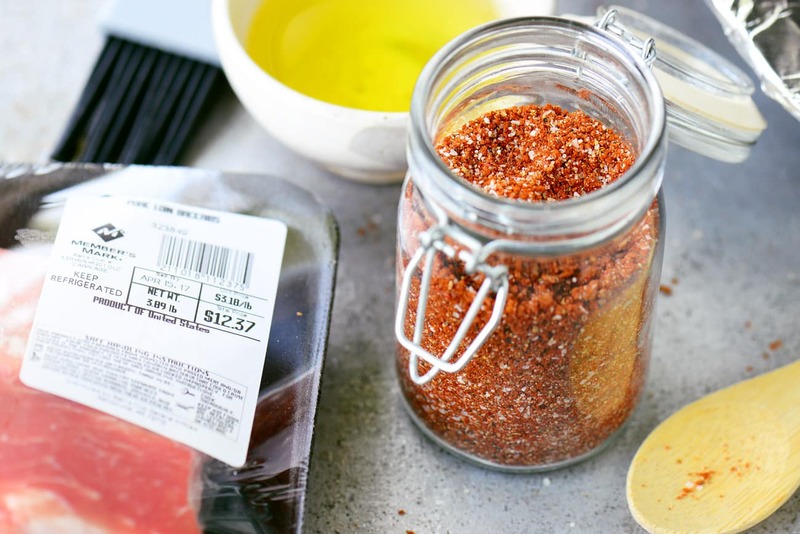 Everyone will love this grilled chicken recipe marinade. 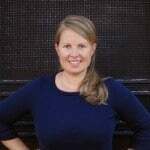 Grilled Corn On The Cob: Here’s how to grill corn on the cob with the husks. It’s so easy to do with no prep, no soaking, and no peeling the sweet corn beforehand. Bloomin’ Grilled Potatoes: Bloomin’ Grilled Potatoes are a fun, delicious side dish to serve at a backyard barbecue or cookout. Everyone will love this recipe for grilled veggies. Peel the thin, shiny membrane off of the bone side of the ribs. Use a knife to lift up the end of the membrane, grab it firmly with a paper towel and peel it off in one piece. 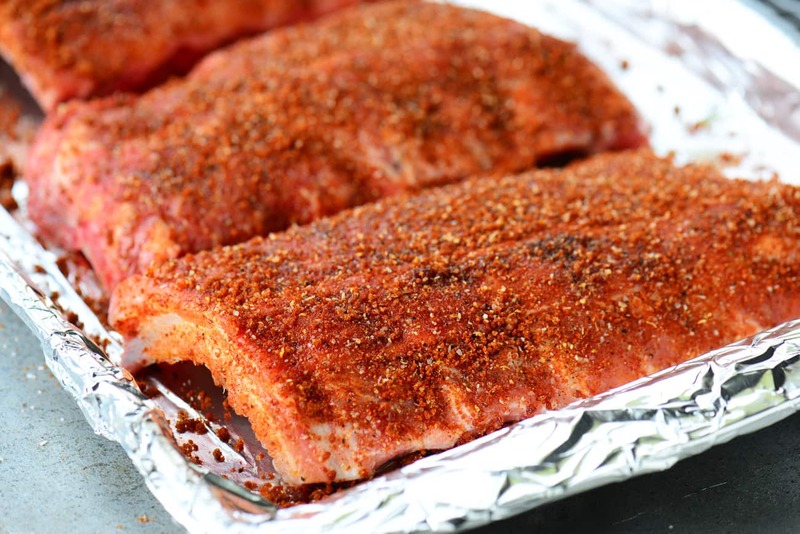 Sprinkle the Savory Rub (recipe below) on both sides of the ribs, gently rubbing the seasoning in with your fingertips. Cover and place in the fridge for 30 minutes. 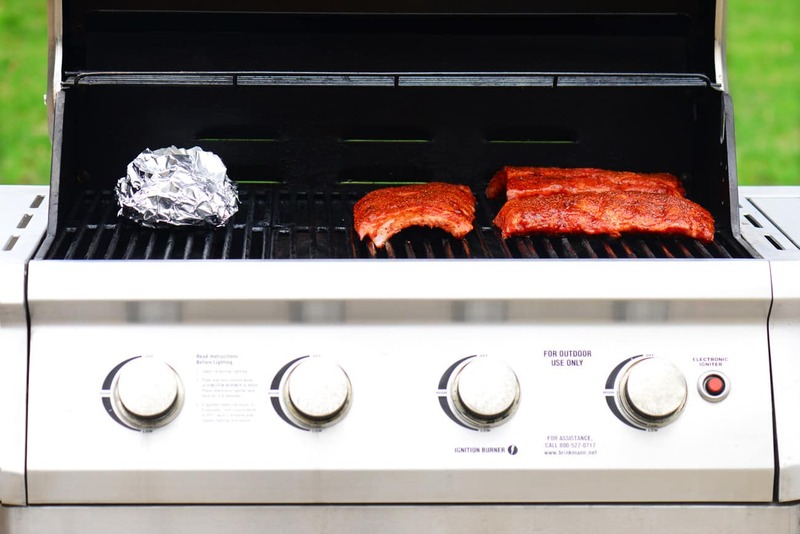 Preheat the grill to 275-300 degrees with a smoke bomb foil packet (optional) on the rack. Turn the burner on the left to low and turn the other burners off. Place the smoke bomb foil packet over the burner that’s on. Lightly grease the grill rack with olive oil and put the ribs on the right side away from direct heat. Close the cover and cook the ribs for 90 minutes and keeping the temperature at 275-300 degrees. Remove the ribs from the grill. 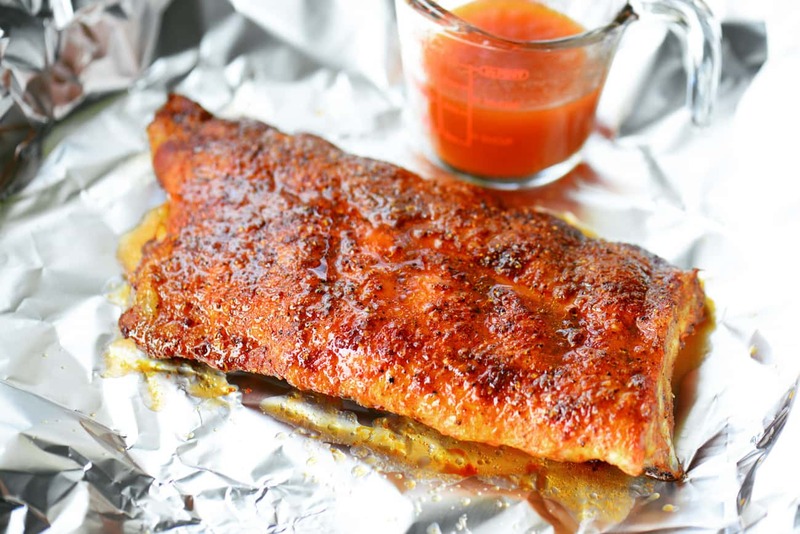 Place a rack of ribs in the center of a large piece of heavy-duty foil, lift the sides of the foil a bit to make a shallow bowl, pour 1/4 cup of the Pineapple Grilling Sauce (recipe below) over the ribs and fold the foil to form a packet sealing the ribs and sauce inside. Repeat with the remaining two racks of ribs. Remove the ribs from the foil, brush with your favorite barbecue sauce and place directly on the grill rack on the right side. Turn the heat on the left burner up to medium and cook the ribs with the indirect heat until the barbecue sauce starts to caramelize about 20-25 minutes. Remove the ribs from the grill and allow them to rest for ten minutes before cutting them into pieces and placing them on a serving tray. Mix together brown sugar, paprika, black pepper, kosher salt, garlic powder, onion powder, and cayenne pepper. Put the rub in a small jar and only remove that you need saving the rest for another time. These ribs look delicious! So juicy. Wow, what a great recipe! I’ve been tying to cook more lately and your blog has been helping me tons. Thank you for all these yummy recipes! !